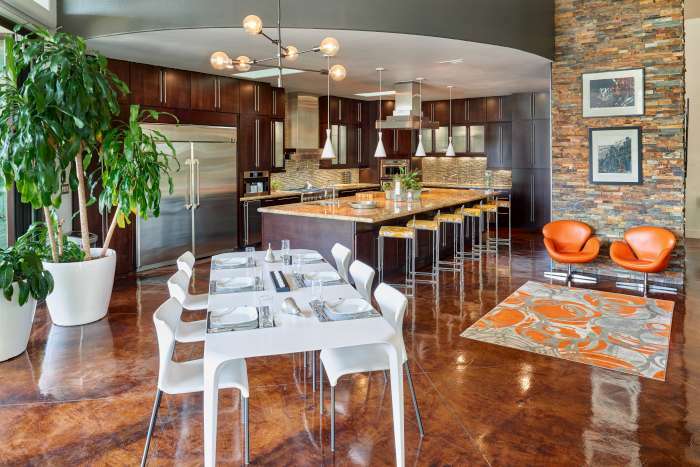 It was nearly seven years ago that the owners of this tranquil, yet dynamic home, embarked on a daily Sunday afternoon of browsing for home décor ideas at various open houses throughout El Paso, this home was the very last stop on their tour. Upon arrival, the owners found quickly that what lied past the front exterior of the home was a complete and total unsuspecting treat that would since change everything. In fact, the day’s agenda for gathering ideas and inspiration for their existing home led the owners to instead pursue the acquisition of this incredible home, soon making it their very own. A complete remodel immediately followed the purchase of the 8,000 square-foot, four-bedroom, five-bathroom home and except for the exterior adobe walls, the entire home “came down” to undergo a massive renovation. The project took nearly an entire year to complete and was, clearly, worth every bit. Today, the home’s façade continues to elude the eye for the unexpected and breathtaking view that awaits beyond initial entry into the home. 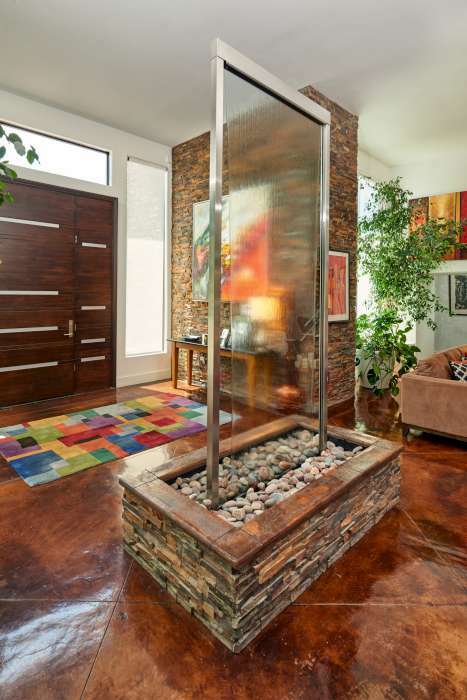 Upon entering the alluring space, one immediately and quite pleasantly meets with an exquisite ten-foot, Zen inspired waterfall that creates a foyer-like area that serves to divide it from both the formal dining and sitting areas in the front area of the home. Beyond that point, one quickly comes face to face with the stunning artwork that adorns the walls of these rooms, truly conversation-worthy, each and every eclectic piece telling a story of its own. As the owner goes on to elaborate on each painting, sharing details on where it was purchased, the artist behind the piece and her inspiration for bringing the piece home, it’s clear that this is one, meaningfully inspired home. What’s more, both rooms flourish with bright hues and unique furnishings, such as the vividly colored, large-scale vases and uniquely life-sized candles, that lend to the artwork, every single detail complimenting the other beautifully and bursting with color. 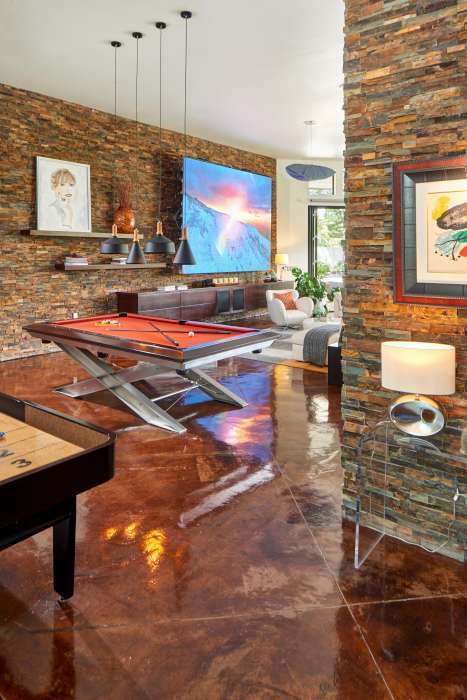 Following these artful rooms, one enters a vast living area that begins with a pool and shuffle board table that surely spells family fun and entertaining at its best. This is only the beginning as when you move along, the home now reveals the most telling part of the renovation: The incredible, floor-to-ceiling accordion windows inspired by a past Hawaiian hotel accommodation on the owners’ trip to the islands and that when fully extended, reveal the calming, tranquil body of water resting directly behind the home. In fact, it’s considered the only natural lake in El Paso due to its natural well and according to the owner, was once a rowing site for area boy scouts some 40 years ago, and still breeds both catfish and carp fish in its warm waters. The small deck at the foot of the beautiful lake and at the tip of the home appeals to the senses and undoubtedly, makes for one of the most relaxing spots there overlooking the water. The outdoor area also houses a sleek and stylish drop pool that gives the mesmerizing illusion of spilling into the backyard lake. The opposite and shallow end of the pool holds a couple of the contemporary Philip Stark chairs that surround the area, and sit comfortably under an enormous yet inviting umbrella that shades the wading area of the pool from right above. 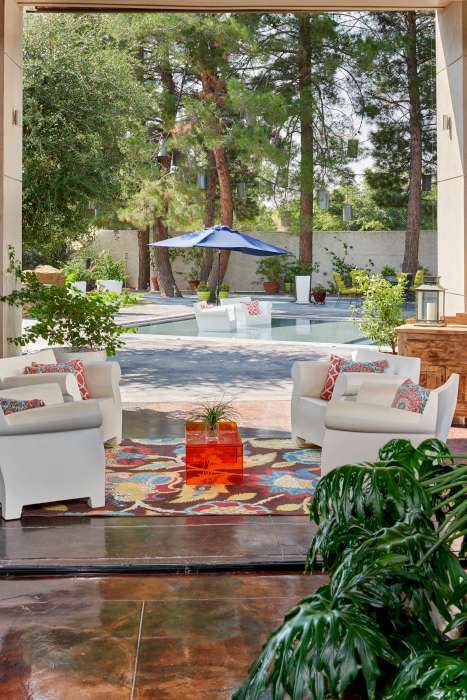 In fact, the entire backyard is comprised of cozy sectionals with loungers and other stylish outdoor seating, as well as an oversized hammock and chaise lounge chair placed strategically under two large trees and that all together, make for the perfect place to enjoy the outdoor setting of this incredible home. 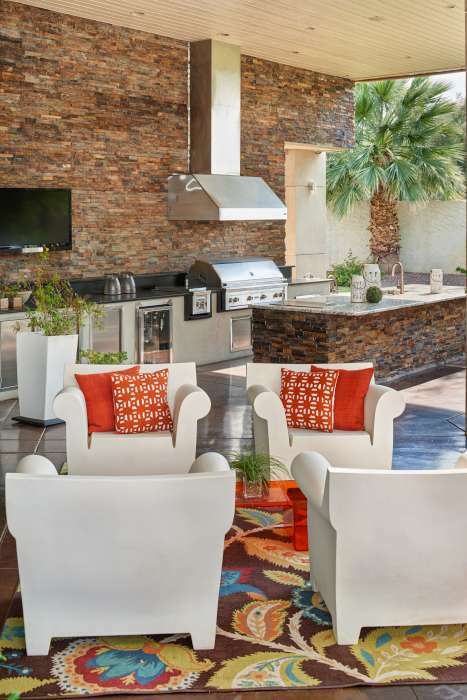 An extension of the full-comfort enjoyment one finds when stepping into the home’s backyard is the beautifully-tiled outdoor gourmet kitchen complete with cooking area, wet bar and sitting area that’s perfect for outdoor entertaining. Add to that the scenic pine trees adorned with their handsome and rustic pewter lamps. Noted as the owner’s favorite trees, these amazing pines span nearly 50 years at the home, lining the entire rear of the backyard and magically looming over the entire home. Then there’s the gorgeous palm trees strategically placed throughout, while large plants in stylish oversized pots lend to the lush greenery both inside the perimeter of the home’s opening to the yard and beyond. Back inside the home in the living area is another true conversation piece that takes the form of a retractable smart tv that was once a literal billboard that the owners purchased from the Canton Triangle in China, while on the hunt for the largest tv they could find. Not finding exactly what they wanted, they stumbled upon a shop where the billboard was on display, made an offer, and although told it couldn’t be done, the home’s owner fashioned the large, high-quality screen into an entertainment delight. In fact, the Chinese shop owner who sold the owners the giant screen came to the Sun City just to visit the home and witness the transformation first-hand. Finally, and what tends to be one of the most important areas of any home, is the gorgeous chef’s kitchen complete with beautiful granite countertops, a sleek wine cooler, ample breakfast bar and all the warm ambiance to make this a favorite place to gather in the home. At last, we find that the true beauty of this one of a kind home lies not only in its stylish interior, artistic flair and unparalleled comfort, it can also be found in the warm and inviting feel of a home that thrives in happily bringing family and friends together. From weddings, anniversaries, birthdays and more, the gracious owners have hosted gatherings both large and small, and always with the agenda of genuinely sharing in the comfort of their home. Further that with the natural and priceless setting of this lakeside home, and prepare to be transported beyond our southwestern desert climate into a realm of scenic beauty that, truly, goes beyond words.